I was thinking about posting the chicken tamales recipe tonight, but since it's really long, I just don't have the patience right now to type it all out. Instead, here's a much shorter recipe, which I'm posting at the request of a friend. It's one of my favorite snack foods -- hummus. It tastes great with toasted pita chips, carrots, babaganoush, &/or stuffed grape leaves. It can be eaten as a snack, appetizer, or as the main course of a meal. It's traditionally served as part of a mezze, (a small selection of dishes eaten for breakfast, lunch, or dinner throughout the Levant region, the Mediterranean, and elsewhere) or piled into a pita, along with tabouleh and falafel, and topped with a small drizzle of tahini. However, you can also take the non-traditional route as well: spread it onto a slice of toast topped with Kalamata olives or use it as sandwich filling between two slices of multi-grain bread, tomato and cucumber slices, and some alfalfa sprouts. Anyhow, hope you will enjoy this recipe! Directions: Stir tahini first before measuring; the oil usually rises to the top, so you'll need to thoroughly blend it. In a food processor, toss all ingredients in a food processor & purée until smooth. (If you like your hummus a bit chunkier, simply don't blend for as long.) 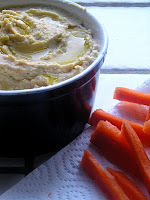 Using a spatula, scoop out hummus into a lidded, non-reactive container, and refrigerate until ready to serve. 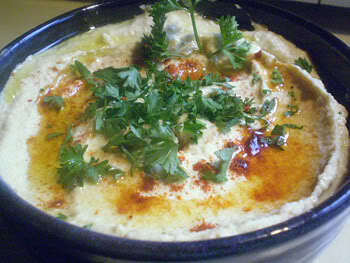 When ready to serve, spread out hummus onto a plate, and lightly sprinkle with paprika. Create a shallow well, and pour a very small amount (1/2 - 1 Tbsp.) of olive oil into the well. Or, alternatively, just drizzle olive oil around in a spiral. Garnish with fresh parsley, place optional condiments on side of the plate, and serve. Chef's Notes: Homemade hummus can be stored in the refrigerator for up to 3 days, and can be kept in the freezer for up to one month. After defrosting or removing from refrigerator, add a little olive oil or water if it appears to be too dry. For a spicier hummus, add a dash of ground cayenne pepper. Thanks, Tracey! I'd previously tossed around the idea of marketing my own brand of tea, but got so busy with my other projects that I had to put this project on hold. For now, I think I'll stick to cookbook writing, but thanks for your vote of confidence. Hope you enjoy trying the recipes & let me know how they turn out for you!